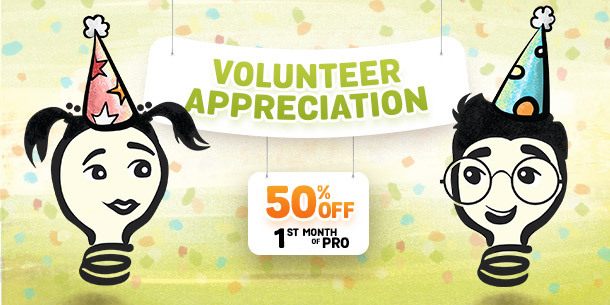 It’s time to celebrate volunteers —the unsung heroes of their organizations. At SignUpGenius, we know just how important it is to give volunteers recognition and the tools they need to succeed. 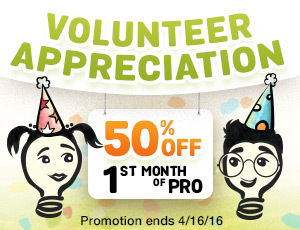 That’s why we’re offering a deal on SignUpGenius Pro from now through Volunteer Appreciation Week (April 10-16). Pro tools will be at your fingertips for half off ($4.99 for SignUpGenius Pro Silver) your first month. Assign multiple administrators to your sign up. Hide dates in the past from your sign up. Link multiple sign ups on one page with an easy-to-use tabbing display. Assign no-ads licenses to your sign ups and include attachments. Implement quantity limits for users and add start/close dates for your sign up. Don’t forget to nominate a worthy nonprofit group by April 16 for a chance to win $1,000. We’ll select five nonprofits for our Hats off to Volunteers $5,000 Giveaway. And stay tuned for more news and extras as we celebrate volunteers in the coming weeks. There’s more you won’t want to miss! Thanks for giving such a wonderful post. NEW! Provide a subscribable calendar of your entire sign up for participants.